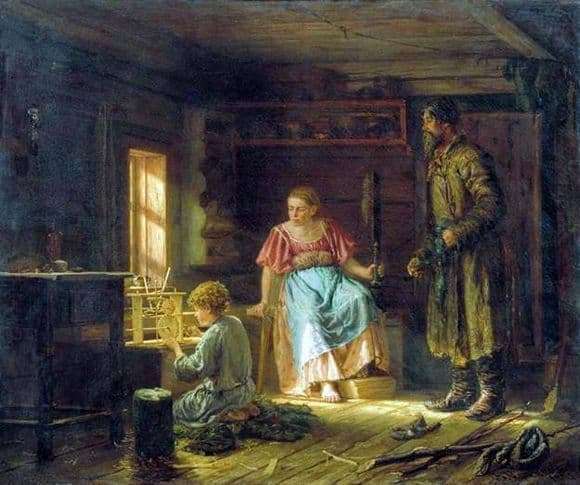 The image of peasant life was one of the main motives of Vasily Maximovitch Maximov, and the artist himself grew up in a peasant family, passed the way from a talented self-taught artist to a graduate of the Russian Imperial Academy of Art in St. Petersburg, familiar to all Russian artists. Like no one else, Vasily Maksimov knew all the peasants’ life, he grew up in a peasant way, he was well acquainted with the life of a simple person working on the land. That is why the purpose of his work chose the art of demonstration, aimed at the disclosure of all the best that is in the peasant life. Thus, the artist revealed the positive beginnings of life in the outback, showed the best qualities of ordinary Russian people. For example, the picture “Boy-mechanic” shows the uniqueness of Russian talent. The originality of those amazing inventors and creators who were raised by Mother Russia in their vast expanses. Joy for his parents, a fair-haired boy, day and night with ignited interest and childish curiosity with his eyes makes some kind of amazing mechanism in his little workshop. His rude mother looks at the boy with tenderness and hope. The father, frozen in the passage, looks curiously over the shoulder of his son, he is surprised and proud of his boy mechanic. The soft light pouring from the window illuminates the room of the young talent. Vasily Maximov unites all those talented craftsmen, artists, architects and inventors who came out of the nation, became famous for his unique talent. Those numerous “Lefty”, which gave birth to our Russian land, according to the artist, deserve recognition and admiration. The artist himself, once being a talented native of a peasant family, spent the rest of his days in wild need, experiencing only deprivation.